Astronomershave discovered what appear to be the coldest failed stars yet found in the universe ?but they're a group of stellar misfits, according to a new study. Scientistslocated the 14 cosmic oddities, called brown dwarfs, using NASA's Spitzer SpaceTelescope. These stars are so cold and faint that they would be impossible tosee with visible-light telescopes, but Spitzer's infrared camera eye was ableto detect their feebleglow, NASA officials said in a Thursday announcement. The browndwarfs are located hundreds of light-years from Earth ? too far away and faintfor ground-based telescopes to see and confirm, using a method calledspectroscopy. Only a handful of the cosmic oddballs have been previouslydiscovered. Thetemperatures of the newly-discovered failed stars range from 350 to 620 degreesFahrenheit (177 to 327 degrees Celsius), which may seem hot, but for a star isactually bitter cold. In fact, those temperatures are comparable, in somecases, to planets that orbit other stars, researchers said. Our sun, forcomparison, averages a temperature of about 10,000 degrees F (5,500 degrees C),NASA has said. The researchis detailed in the Astronomical Journal. While browndwarfs have been hard to find in the past, but should soon be coming out of thedark in droves, NASA scientists said. "WISEis looking everywhere, so the coolest brown dwarfs are going to pop up allaround us," said Peter Eisenhardt, the WISE project scientist at NASA'sJet Propulsion Laboratory (JPL) in Pasadena, Calif., and lead author of Spitzertelescope study. "We might even find a cool brown dwarf that is closer tous than Proxima Centauri, the closest known star." WISE issearching a volume of space that is 40 times larger than that sampled in therecent Spitzer study, which only concentrated on a region in the cosmos in theconstellation Bootes. The Spitzer mission is designed to stare at targetedpatches of the sky in great detail, whereas WISE is charged with inspecting thewhole sky. Browndwarfs, like stars, form from collapsing balls of gas and dust, except they are muchsmaller in comparison, never collecting enough mass to trigger nuclear fusionand shine with starlight. The smallestknown brown dwarfs are about five to 10 times the mass of Jupiter ? which is asmassive as some known gas giant planets around other stars. Brown dwarfs startout with some internal heat left behind from their formation, but as they age,they cool down. The first confirmed brown dwarf was announced in 1995. "Browndwarfs are like planets in some ways but they are in isolation," saidastronomer Daniel Stern, co-author of the Spitzer paper at JPL. "Thismakes them exciting for astronomers ? they are the perfect laboratories tostudy bodies with planetary masses." Most ofSpitzer's newly-discovered brown dwarfs are thought to be part of the coolestknown class of brown dwarfs, called T dwarfs, which are approximately less than2,240 degrees Fahrenheit (1,220 degrees Celsius). One of theobjects appears to be so cold that astronomers think it may even be an elusiveY dwarf ? a proposed class of even colder stars. The T and Y classes are partof a larger system that categorizes stars; for example, the hottest, mostmassive stars are O stars; our sun is a G star. 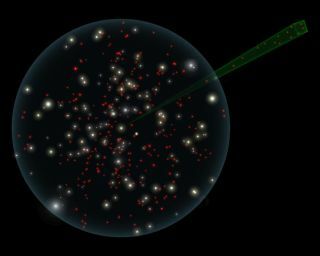 "Modelsindicate that there may be an entirely new class of stars out there, the Ydwarfs, that we haven't found yet," said Davy Kirkpatrick, a co-author ofthe study and a member of the WISE science team at the California Institute ofTechnology in Pasadena, Calif. "If these elusive objects do exist, WISEwill find them." Kirkpatrick isconsidered an expert on brown dwarfs, and himself came up with the L, T and Yclassifications for the cooler stars. He believesthat it is possible for WISE to detect an icy, Neptune-sized or bigger objectin the far reaches of our own solar system ? thousands of times farther fromthe sun than Earth. Yet, there is some speculation among scientists that such acold body, if it even exists, could be a brown dwarf companion to our sun. Researchershave nicknamed this hypothetical object "Nemesis." "We arenow calling the hypothetical brown dwarf Tyche instead, after the benevolentcounterpart to Nemesis," Kirkpatrick said. "Although there is onlylimited evidence to suggest a large body in a wide, stable orbit around thesun, WISE should be able to find it, or rule it out altogether." Theexistence of the brown dwarfs found by Spitzer implies that there could be ahundred or more similar objects within only 25 light-years of our sun. And,since WISE casts its eyes everywhere, it is likely that the space telescopewill find these missing orbs, which will be close enough to confirm withspectroscopy. In fact, itis possible that WISE will even find more brown dwarfs within 25 light-years ofthe sun than the number of stars known to exist in this area of space. "WISEis going to transform our view of the solar neighborhood," Eisenhardtsaid. "We'll be studying these new neighbors in minute detail ? they maycontain the nearest planetary system to our own."